A hard lozenge with soothing, Therapeutic Young Living Essential Oils! There are so many uses for Thieves including making these essential oil drops. These are sugar free and have immune supporting therapeutic grade essential oils in them. They are easy to make with just honey and your essential oils! And best of all, you can make them as strong or as mild as you like! You can also use your favorite essential oils! Lemon, Lime, Orange or Citrus Fresh would all by yummy choices! 1 cup honey, brought to 300* using a candy thermometer as instructed. It took about 20 minutes for mine to reach 300 degrees. Stir often and start on med low heat. Then turn to low to prevent boiling over. It will keep boiling (adjust temperature as needed). ***BE CAREFUL, the honey can burn easily!!! So, you do not want to boil it at too high of a temperature. Also, I added a teaspoon of butter to keep the foaming down. ****You may have to boil for a few minutes longer if you live in a high humidity climate so the drops aren’t too soft. But be careful not to burn them! Allow to cool for a several minutes, until it starts to thicken. This can be tricky so you’ll need to move fast once you see they start to thicken and depending on your mold. You can add just 10 drops of Thieves. Or I wanted a Honey Lemon flavor, so here is what I did: I started with 7 drops of Thieves, 3 drops of Lemon and 2 drops of Eucalyptus Globulus (Young Livings Eucalyptus Globulus is labeled as a supplement and safe for internal use, but no other brand would I consume internally). After I mixed it all together and tasted it (be careful it will be hot! I placed a drop on a piece of parchment paper over some ice to cool it quickly, then tasted it). I added more. Add more or less oils to your taste, but here is what I finally ended up with: 11 drops of Thieves, 7 drops of Lemon and 3 drops of Eucalyptus Globulus. I really liked that combo, it wasn’t too strong, but I could taste all the flavors of the oils. After they sit for a few days/weeks I may decide they need more or less, but right now, I liked it! 🙂 Tweak the amounts and combos of oils to your taste and liking. ***I only ingest Young Living Essential Oils. Never ingest any other brand!!! Drop onto a sheet of Parchment paper to the size that look like that of a lemon drop. Or, I found these silicone molds on Ebay that were the perfect shape for what I was wanting to do! They worked out well by filling the molds up and they just popped out with ease and are perfectly shaped! 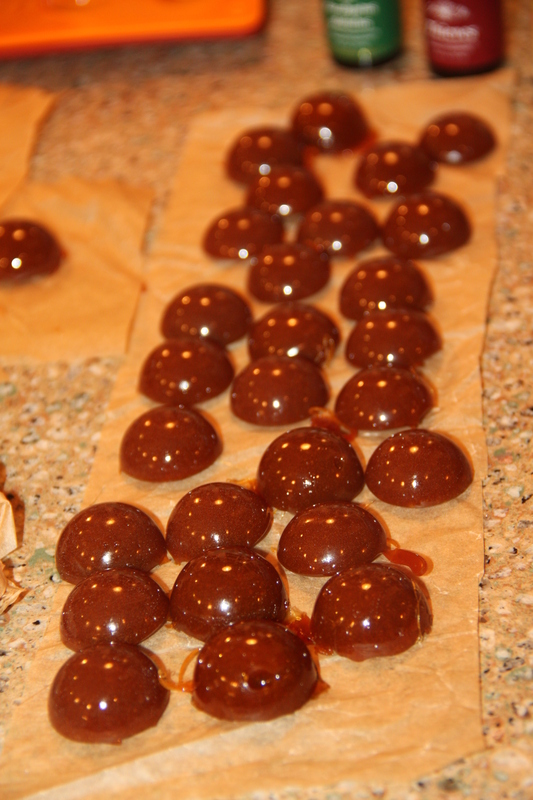 ***This recipe will be much easier if you have some sort of a small candy mold to work with. 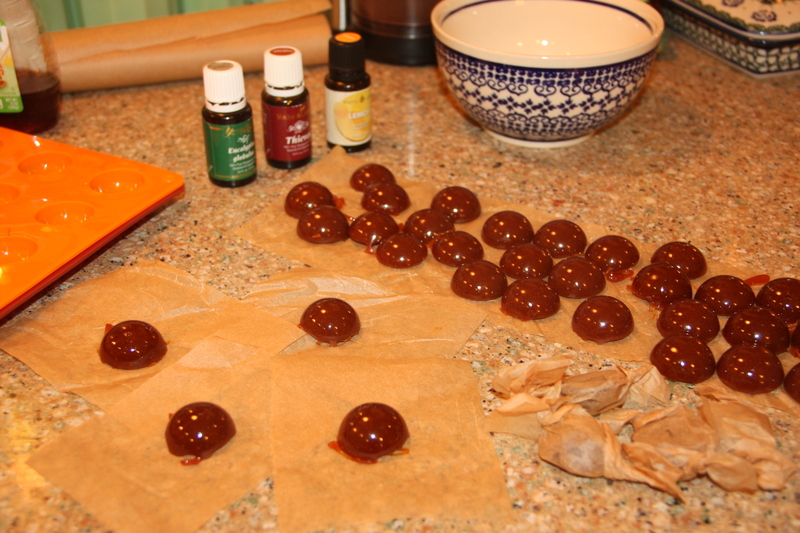 The cough drops may start setting up if you try to drop all the mixture onto parchment paper unless you work very quickly. I got my molds HERE . Or you can look HERE . Let cool until hard, pop out of the mold and than wrap up in parchement paper. DO NOT use wax paper or your cough drops will stick onto the wax paper! Keep them in a container in the medicine cabinet. *I only recommend using Young Living Therapeutic Grade (YLTG) Essential Oils in this recipe, since they are pure enough to be ingested, and lower quality oils may be toxic. Many Blessings & Happy Oiling! Stock up on Thieves by ordering as a retail customer by clicking Here or save 24% by buying as a wholesale customer! Click Here for more information on saving 24% off of retail! ***By the way, I am not a doctor – just a mom who uses essential oils in her own family. Please know that any information provided on Mamas Essential Oil Cabinet is for educational purposes only. It is not intended to prescribe, diagnose, treat, cure, or prevent any disease. It is your responsibility to educate yourself and address any health or medical needs you may have with your physician. Please seek professional help when needed. Thank you for stopping by and reposting my article! I did not think that eucalyptus globulus should be taken internally?!? Awesome recipe!!! Thanks for sharing. Your welcome Marilyn! I’m glad you liked it! Have you had a chance to try the cough drops? Would you change the recipe? Thanks! could you use maple syrup or agave instead of the honey? 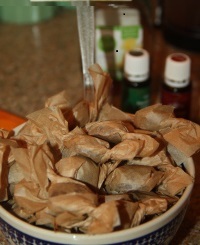 Just so you know that the therapeutic properties of honey are destroyed by boiling, but it is a better alternative to sugar..
What is the brown paper that you used to wrap your cough drops, and about how long did it take for the cough drops to cool? Thank you! Hi Kim! I used an unbleached, all natural parchment paper that I get from my co-op or natural food section. You could use regular parchment paper too if you like. And, it didn’t take long for the cough drops to cool. I think about 30 minutes or so. It will depend on the climate you are in and if it is a humid day or not. But not too long at all! Thanks for stopping by! What a great post! And even a link to the molds!! Woohooo!!! Just one quick question… Now that you have tasted them would you modify your EO drops at all? Thanks!!!! Thank you Mrs. Hellwig! I would not modify the amount of oils. I tend to like them a little strong, so if you like a more milder taste, you can just add a bit less. But, I liked this proportion for my taste! Thank you for the comment! Yes these are safe for kids. My kids use them all the time. But, only when made with Young Living Essential Oils. I would never ingest any other brand as I know how Young Livng grows their plants, distills their oils and bottles them with NO synthetic fillers. Unlike most other essential oil companies out there. And yes you can use agave nectar if you like, I do prefer honey though. You can adjust the amount of the essential oils to your preference. Oh how I wish I had found this when Thieves lozenges were out of stock and I needed them. I need never worry about that again. Thank you so much! Now I can make some with maple syrup for my daughter (honey allergy) and a batch for the rest of us made of honey. Hello, there. Thanks for sharing such a fantastic recipe/tip! Just curious if you have any idea what the shelf life of these drops might be? How many did this recipe yield? Awesome idea so looking to do this! Hi Sarah, Thank you! This made 48 drops in my molds. But it would entirely depend on what size of mold you use. Enjoy! Sarah I wondered that too, how many does it yield approximately? This made 48 drops in my molds. But it would entirely depend on what size of mold you use. Enjoy! How long do you think the cough drops will keep stored? Mine stored for a few months before they were all gone. But, do not store them in the bathroom where there is condensation from the shower. That could cause them to go soft. Hi there! I just made these for the first time and I followed the recipe exactly except I used less oils, however mine are really chewy and have been cooling for hours! I’m not sure what I did wrong. Any ideas? Thanks! Sorry Annette…I would try to make sure that your candy thermometer is working properly. Candy is really tempermental. 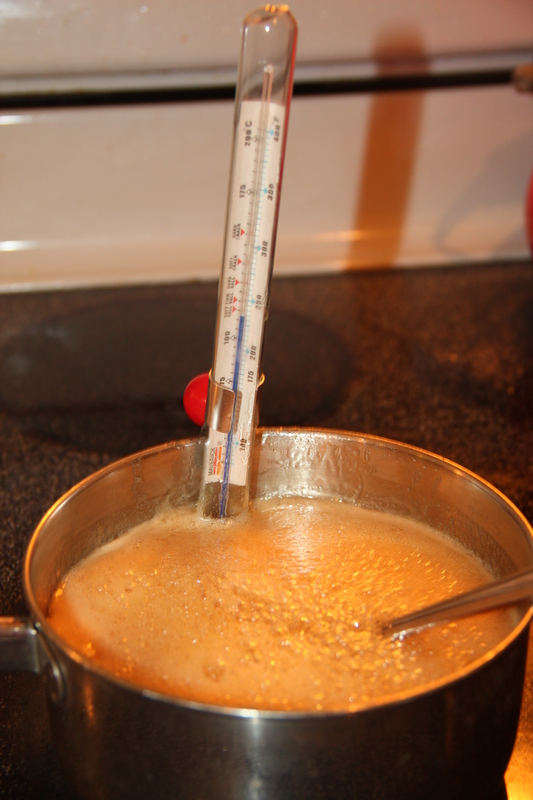 I would test your thermometer by putting it in boiling water and make sure it reads 212 degrees. When brought to the right temp and boiled long enough, they should be a hard cough drop. Maybe try getting a new one? Hope your next batch works better! I wonder if the shape and size of these drops would cause a chocking hazard. Hi Patti, These are no more of a choking hazard than normal cough drops. I would not give them to a small child if that is a concern. Thanks. Sorry Emily…I would try to make sure that your candy thermometer is working properly. When my molds were full, I did have some left over that I just made small discs on the parchement paper and that worked fine. But I would say you maybe didn’t boil it long enough or try a different thermometer. What is the consistency of these cough drops? I made a different honey cough drop recipe a few months ago and they were like taffy… which totally wasn’t doing it for me.. They tasted lovely and did help my throat but I couldn’t use them at work because of how long it would take me to eat one 😉 I couldn’t talk with patients until they weren’t in my mouth anymore, ha. I wanted something that would stay hard, more like a storebought throat drop. I know it has to do with the temp you get your ingredients to but I am not a candy maker and don’t know a lot about that kind of thing..
Hi Laura, Thank you for your question. When using a candy thermometer and taking it to the temperature called for, this is a hard cough drop like the store bought kind. I tried them again thinking I didn’t let it get hot enough (the thermometer is brand new) and they did set much faster, and looked like yours (I even have the same molds as you I found on Amazon) but they still got chewy after they warmed up in my mouth and we’re constantly sticking to my teeth. Is that what they are supposed to do? I’m just not sure what the consistancy is supposed to be like when made correctly. Thanks! Btw, did you try making them with maple syrup? If so, what temp did you heat it to? Never made candy before but my temperature seems to be stalling out at 260 any advice? I have tried aking other types of cough drops before but I cant wait to try yours. I will prefer stronger tasty and hard drops. Which of the starter kits do you advise that i start with. I’m so glad you stopped by! I absolutely love these cough drops! I just made another recipe about a month ago! You can add more drops if you prefer for a stronger taste! And, I think you will be happier if you try to get some molds like I have pictured or something similar. It will make the pouring process easier and less stressful. I would recommend the Premium Starter Kit. You get 11 bottles of oils and a Diffuser which is a must have! It’s definitely the best value! Here is a link to order that, and when you order the Premium Kit, you will be able to buy all products for wholesale! Here is the Link: https://www.youngliving.com/signup/?sponsorid=1297754&enrollerid=1297754 And, if you are interested, let me know, I just got a $20 coupon. I only have one though. So, if you want it let me know! Let me know if there is anything I can do to help you! My biggest issue was the candy cooling too quickly!!! Next time I am going to try lining my jelly roll pan with parchment or wax paper, top with my silpat dusted with powdered sugar and just pour the whole batch on top and then cut with my big knife (I’ll try rubbing with oil or dusting with powdered sugar helps it slice threw cleanly). I love the exact drops of oils used. I did switch the eucalyptus for peppermint (also for family acceptance). I’m also going to make a batch and just use lemon for lemon gobs. My mom only likes lemon drops for her cough drops. Thanks again!!! Love the recipe, super easy to follow with excellent results. I Have been asked by many of you to republish this post! So, after revising the name to be compliant….here it is! Sorry for any inconvienence of it being offline for a while. Enjoy! I have such a goofy question. I am not a candy maker, and completely incompetent in the kitchen most of the time…so can you tell me the proper method for filling your silicone trays? 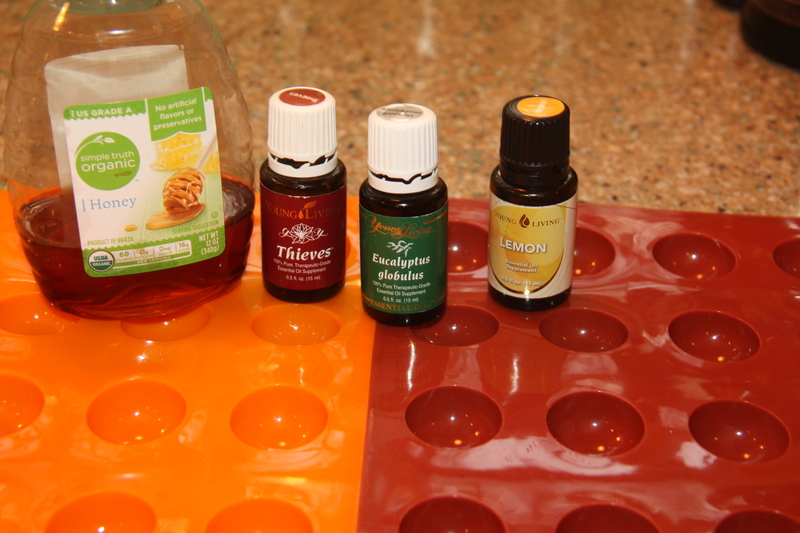 Do you just pour the mixture out over the entire surface, or use a dropper to fill the molds? I know that sounds so elementary, forgive me! Hi Tina! Not a goofy question at all! 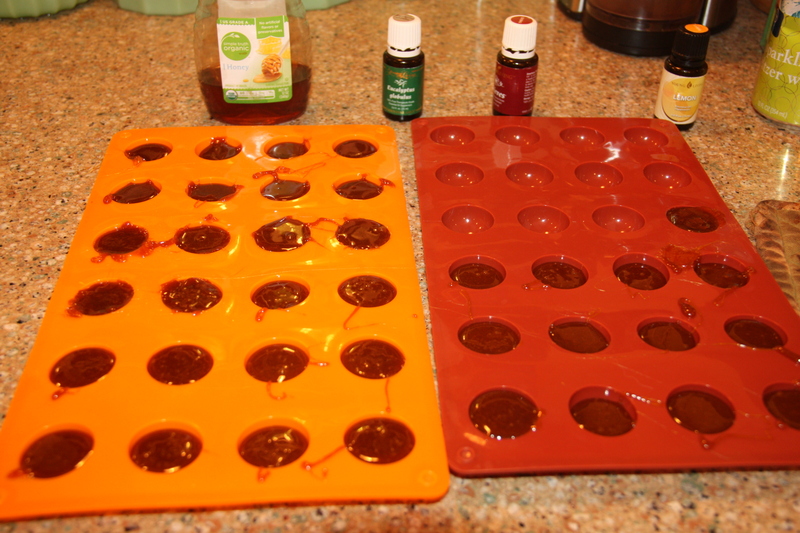 I pour the syrup into a glass measuring cup and pour from that into each mold. I think if you pour over the entire surface, you would have a big mess! Thanks for your question and for stopping by!